Fair Market Value is calculated using figures from Buc Value Pro, ABOS Marine Blue Book, Yacht World’s Soldboats.com, as well as similar boats currently for sale. We then adjust these figures based on the condition of the boat, region of the country (Southeast vs. Northeast for example), engine hours, equipment packages, partial refits, etc. Most insurance companies and financial instituions require a Fair Market Valuation before they will insure or finance a boat. They will also require re-surveys and re-valuations after a ceratin period of time, usually between 3-5 years. Think of the C&V survey as a slighly abbreviated pre-purchase survey. While most of the survey principles remain the same, most C&V surveys exclude haul-outs and sea trials. This is mostly due to insurance companies and banks not requiring them. Sometimes older boats, or boats that have not been surveyed for a long time, will require a haul-out, but I have yet to hear of a sea trial requirment from a bank or insurance company. Also, the survey is performed on behalf of the boat owner who already knows how the boat performs. This doesn’t mean the survey process is any less strict. The last thing a surveyor wants to hear is that a boat he performed a C&V survey on starting having issues. So even though it’s a mandatory part of boat ownership for most folks, it’s also a good time for boat owners to get feedback on systems they might not have noticed. “PUFFIN” is an example of a boat that needed to be hauled for her C&V survey. She has a metal bottom, which means potential for corrosion, which means potential for flooding or sinking. In this case, “PUFFIN” was being surveyed prior to being cast as the co-star of the new Gary Oldman movie, “Mary”, set to come out later this year. Gulf Craft 81', "NEW ISLAND PRINCESS"
Another example of a metal-bottom boat requiring a haul out for C&V purposes. “NEW ISLAND PRINCESS” is South Carolina’s largest head boat and is based out of Murrells Inlet, SC. 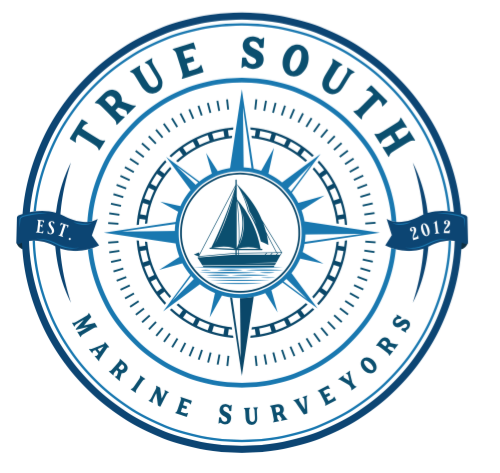 Copyright © 2019 True South Marine Surveyors LLC. All rights reserved.